A few weeks ago, I saw Martha Stewart's Borax crystal ornaments online. They looked like they would be so much fun to make. Plus, I had a huge box of Borax just languishing in the garage. I decided to try it first on my own to see if it would work. Well, as I've discovered before, I am no Martha. The ratio of 3 Tablespoons Borax to 1 cup boiling water just did not work for me. I tried it twice and let the ornaments sit overnight...nothing. Well, not exactly nothing. I got one crystal on the pipecleaner. So, I played around with different ratios and got varying results. My 1:2 ratio when left overnight developed HUGE crystals - a little too huge for my taste. 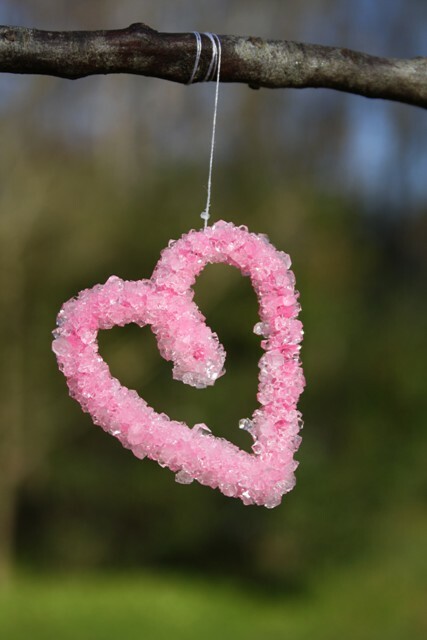 However, the small heart that I made with about 5 Tablespoons Borax to 1 cup boiling water produced beautifully small crystals. Form the desired shape out of pipecleaners. Use scissors to cut the pipecleaners. You'll want to make sure that your ornament can fit inside your glass jar without touching the bottom or sides. Tie a thread around your ornament and attach it to a stick. You'll need to adjust the length of the thread so that it will suspend the ornament into the jar when the stick is placed over the top of the jar. Combine Borax and boiling water in the glass jar. I used a ratio of 5 Tablespoons Borax to 1 cup water. But, you may need to play with the ratio. Some online instructions I read said the water should be cloudy. Stir to dissolve. If you use white pipecleaners, you can tint the color of the ornament by adding food coloring to the water. Lower your ornament into the solution and rest the stick on top of the jar. Make sure the ornament does not touch the bottom or sides of the jar. Allow to dry completely. Hang as an ornament with ribbon or fishing wire. For extra durability, you could try finishing the ornament with acrylic spray. Depending on the shapes you create, you could use these as decorations throughout the year. I think they would be really pretty suspended in a window with some fishing wire! Super cute and creative Janel. We may have to do this too. It's not an exact science. We made four different batches with the same ratio. Three turned out similar, one didn't have any crystals on it...and then bam a few minutes later it did. But, they looked a little different. The girls really loved it.